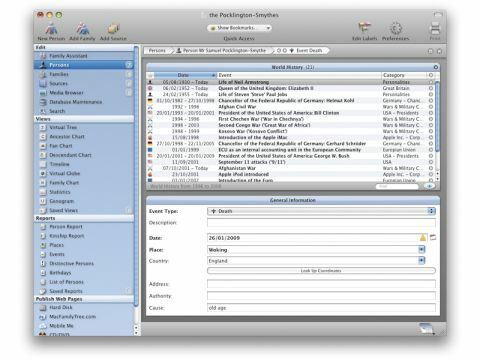 As an industrial-strength genealogy application for the serious family historian, MacFamilyTree is tough to beat. You can rough out a family tree pretty quickly and then return to fill in the details as you research them – and boy, does MacFamilyTree support details – or, if you already have all the information to hand, creating entries is straightforward once you get into the rhythm of it. The interface is not always so intuitive – adding parents to a person's entry is confusing, for example – but once you're familiar with these quirks, you'll find that the manner in which MacFamilyTree presents your data and options is consistent, and as your family database grows, you'll appreciate the ways that the application allows you to make links between individuals. The level of detail supported by MacFamilyTree will satisfy all levels of genealogists. For instance, more than 50 events and other types of information can be stored for each individual, ranging from the obvious (name, birth date, death date) to the more arcane (bar mitzvah, emigration, miscarriage, probate). There is some US bias, as in categories for social security number and for events specific to the Church of Jesus Christ of Latter-Day Saints (Mormons), but there's no compulsion to use them. There are no glaring omissions, and any extras you need can be covered with the catch-all Other Event category. For the dedicated family historian, merging, appending and exporting files compatible with the Genealogical Data Communication (GEDCOM) will be valuable, while the more easily amused will appreciate the 3D family trees, with little man-and-woman icons representing each ancestor. More than just a gimmick, these are also a handy way to skip from one person's record to another without scrolling through a list of names. Of course, that's not the only way MacFamilyTree can present the data you've entered. Other options include ancestor, fan and descendant charts; a timeline; a globe, if you've provided coordinates for events; and lists of persons, kinship, places and the like. Another feature allows you to browse historical events that coincide with dates you've entered; they're automatically linked to the relevant Wikipedia pages, and you can create your own events and web links too. And once your family tree is complete enough to show off, this application lets you publish it to HTML on your Mac's hard disk, Mobile Me or CD/DVD, or log on to the MacFamilyTree site and host it there. Date and name formats and the like are all customisable, so users who need to adhere to specific standards are well served. The range of choices, both in data entry and in presentation, can seem overwhelming, and there are times when the interface is befuddling. However, MacFamilyTree is worth persevering with – and the level of detail that it supports may even encourage you to explore deeper into your family history.